The Purdue Database which collects data from all the veterinary schools in the United States lists Glaucoma as the 7th most common problem in the Boston Terrier. To put this in perspective, the database lists Cataracts (all kinds) at 190 reported cases in a 5 year period (and this makes cataracts the top problem in our breed). and Corneal Ulcers 52 cases. Then there were Mitral valve 42 cases, Heart Murmer 36 cases, Epilepsy 33 cases, Allergic dermatitis 29 cases, and Glaucoma 24 cases with most cases being diagnosed in dogs over 7 years of age. 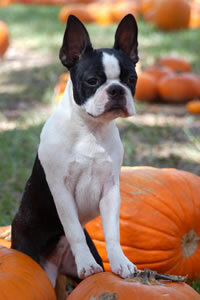 The Following are articles or website links about genetic and/or general health problems that can effect Boston Terriers. Copyright © 2013. All Rights Reserved. Website by Prize WebWorks, Inc.